Welcome High Commissioner and President Bachelet. Firstly, I would like to thank the independent expert Livingstone Sewanyana. We would have appreciated a mention of the trip and report by the independent expert Alfred de Zayas to the Bolivarian Republic of Venezuela, as well as to Ecuador. However, we have to thank Alfred de Zayas for the courage of having travelled to Venezuela, in spite of the attacks he received, even before coming to the Venezuelan territory, undermining the work to be done o even receiving personal attacks. This report on his visit to Venezuela is very different from the reports issued so far by the Office of the High Commissioner for Human Rights. This is an objective report from our point of view. Even though we do not agree with all the recommendations and provisions therein, it is an impartial approach that is worth to be studied in the special case of Venezuela, which is permanently in the arena of the media worldwide. It was not a selective report, it was not a report with a specific political position, or intended to try to interfere with the internal affairs of the countries he visited. The independent expert De Zayas had free access, free mobility; he met with the civil society; he met with the government authorities; he met with the opposition factors; he met with the victims of the political violence in Venezuela, he met with the families of the detained people for carrying out political violence in Venezuela. He had full freedom of being in contact with all the parties. The only obstacles he had – as we called them – are those who tried to impede his visit, and that afterwards attacked him permanently in order to prevent him to speak his version of the objective reality of what happens in the Bolivarian Republic of Venezuela. Actors and interests “Interested” (you will forgive the repetition) in trying to use the excuse of human rights to interfere Venezuela, in attempting to spread the matrix of “humanitarian crisis” in Venezuela, with the purpose of promoting a multilateral, international intervention in Venezuela, thus violating its sovereignty. The expert Alfred de Zayas concluded in his report that in Venezuela there is no humanitarian crisis; in Venezuela there is an economic crisis which is product, fundamentally, of the unilateral coercive measures, of sanctions, both from the United States and from the European Union, which aggravates the economic situation in Venezuela. The expert Alfred de Zayas could also get to know the model of guarantee of human rights in Venezuela, which continues despite the measures and the financial blockade, and the media campaign against Venezuela. In his words, “I observed – De Zayas said – the eradication of analphabetism, free education from primary school to college, programs to reduce extreme poverty, delivery of houses to people in vulnerability and homeless, gradual elimination of privileges and discrimination, and broadening of medical assistance for all”. The expert Alfred de Zayas confirmed the multiform, comprehensive aggression against Venezuelan economy, from the so-called sanctions which are not sanctions, because the U.S government has no moral authority to sanction anyone. These are unilateral, coercive measures outside the framework of public international law, to force a change of regime, even including the threat of the military option, by the U.S President himself, Donald Trump. From information in the U.S media this last week, as well as from spokespersons of the U.S Government, plans have been confirmed to intervene Venezuela, to promote a military coup d’état to undermine our democracy and for a military intervention in Venezuela. Perhaps, Venezuela has too much oil, too much gas, too many resources, and that makes it a target of the great capitalist interests of the world. The expert wrote in his report: “In order to impeach some governments, their weaknesses on human rights are increased to make more acceptable their violent overthrow. Human rights are becoming a weapon against their enemies despite they constitute the legacy of each human being and they must never be instrumented as weapons of demonization”. In the economic aggression against Venezuela, the report of De Zayas recognizes the artificial manipulation of the oil international price, the alteration of the Country Risk, the attack against the Venezuelan currency, the smuggling activities. And all of this, we add –as we already said it- the unilateral coercive measures of the United States and the European Union. It is a great cynicism of those who block Venezuela and then offer humanitarian aid. That is to say: I hang you and then I pretend to be your savior. This Council has recognized that the unilateral measures are contrary to international law, to the Charter of the United Nations and to the regulations and principles that regulate peaceful relations between States. It has also recognized how these unilateral coercive measures hinder, interfere and impede the full enjoyment of human rights. In the recommendations given by the independent expert De Zayas, he even suggests that the International Criminal Court must consider the effects of sanctions, of the unilateral coercive measures, as crimes against humanity, and that the International Justice System must take a position and take action against these unilateral measures. We denounce these measures and request, on behalf of the Venezuelan people, on behalf of President Maduro – and now more, with this report that corroborates it – the cessation of the aggression against the Bolivarian Republic of Venezuela; a political and economic aggression, the threat of use of military force, the media aggression against our country. It is supposed that the States have to collaborate; the States have to cooperate with each other. The expert’s report has a constructive approach, although we insist that we do not agree on all its parts and recommendations; however, it has of great value to objectively study the Venezuelan reality. The function of the Universal Human Rights System is that we all have to build and cooperate in the design and implementation of policies that consolidate progress and overcome the challenges that may exist on human rights. Experience shows that there are no concrete or positive results if the path of pointing is taken, the path of defamation with unsupported arguments, without rigor, as the reports of the High Commissioner, up to now, have shown. 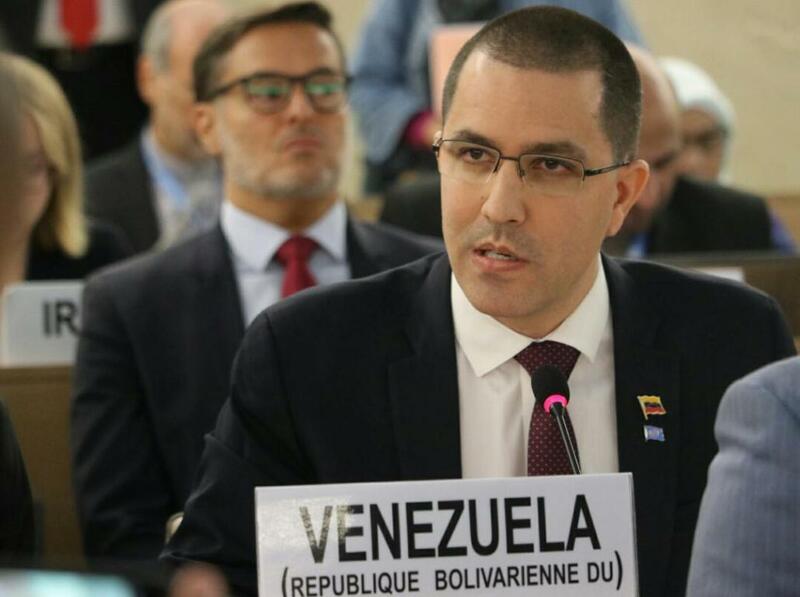 We ratify once again the commitment of the Bolivarian Republic of Venezuela with the Universal Human Rights System. We reaffirm once again our desire for cooperation and collaboration, both with the Office of the High Commissioner for Human Rights, and, of course, our leading role in this Human Rights Council, and we thank once again the participation and courage that the independent expert had on the promotion of a democratic and equitable international order, Alfred de Zayas.